Redmi Note 7 Pro Likely to Debut as First Snapdragon 675 Powered Phone - Playfuldroid! The Redmi Note 7 is the first phone to go official after the separation from Redmi brand from its parent company Xiaomi. 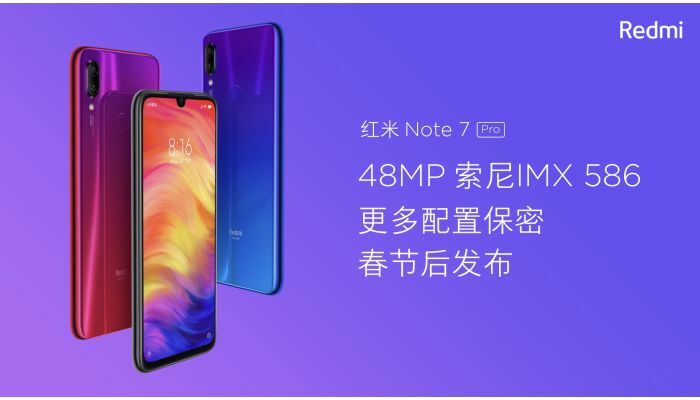 At the Jan. 10 launch event of the Redmi Note 7, the company had confirmed that after the Spring Festival in February, it will be debuting the Redmi Note 7 Pro smartphone. Leaked information that are now doing rounds on Weibo has revealed that it could be powered by Snapdragon 675 chipset. The Redmi Note 7 features 48-megapixel Samsung ISOCELL GM1 sensor. At the launch of the smartphone, the Chinese manufacturer had confirmed the Redmi Note 7 Pro arriving in February will be equipped with Sony IMX586 48-megapixel sensor instead of Samsung GM1 lens. New leak reveals that the Sony IMX586 edition of the Redmi Note 7 Pro could be powered by Snapdragon 675 instead of the Snapdragon 660 that drives the non-Pro model. In October 2018, Qualcomm had launched the Snapdragon 650 mobile platform. At that time, Xiaomi had confirmed that it will be the first company to launch Snapdragon 675 powered phone. So far, various phones such as HiSense U30, Meizu Note 9 and Motorola P40 are rumored to feature the SD675 SoC. However, there is a possibility that Redmi Note 7 Pro may end up as the first phone with SD675 chip. Some rumors claim that the Redmi Note 7 Pro could be priced at 1,499 Yuan ($221). The highest edition of the Note 7 is selling for 1,399 Yuan ($207. With inclusion of a newer chipset and better camera, it may cost much higher than the rumored 1,499 Yuan price tag.